Late fall and winter provide a new set of challenges for our feathered friends. Most of the lush vegetation, full of berries and seeds, has withered away. In addition, most insects are either dead or dormant and the heavy snows will soon bury most natural sources of wild bird food. Not only will the birds’ food sources be changing, but their nutritional needs will, as well. Foods higher in fat and oils will help supply them with more energy for winter survival. Though most wild birds survive just fine on natural food sources, many species will come to feeders to supplement their wild diet. It’s important to note that feeding will not affect population numbers of birds, but it will certainly help individuals during the extreme winter weather, as well as provide an excellent opportunity for bird watching. For winter use, feeders should have some sort of cover to protect the seed from being buried during snowy weather. Keep in mind that most feeders fall into two categories: Selective and non-selective. Selective feeders are designed to discourage such birds as starlings, house sparrows and crows. Non-selective feeders are larger and provide a perching area large enough for most birds. Another thing to consider is water. A supply of fresh, unfrozen water in the middle of winter will do wonders to increase your bird traffic. It is just as essential to their diet as good quality feed, yet simple to overlook. The shape of the feeder isn't as important as where it is located in the yard. The feeder should be sheltered from the harsh winds. It’s a good idea to place the feeder fairly close to the house if indoor bird watching is important. Keep in mind that to reduce the risk of window collision, you shouldn’t place the feeder any more than 5 feet from any walls or windows. When a bird takes off from a feeder located over 6 feet from a window, it will be going at its top speed if it were to collide. Having the feeder closer reduces the severity of the collision, should it occur. Because birds like cover, it is a good idea to place the feeder near trees, bushes or shrubs. This will offer them some additional protection from the wind and predators. Remember to hang your feeder low enough so that refilling it won’t be too much trouble in the bad weather. Keep feeders clean after each storm, so that the seed is easily accessible. Shovel or stamp the snow around the feeder area so that the ground feeding birds can more easily find the spilled seed. Once you start feeding during the winter, you shouldn’t stop, because the birds will become used to your feeding stations. Wait until spring, once insects and vegetation are once again available. Consider putting out food daily. This will insure that it is fresh and will reduce the risk of waste. Figure on what they will need before sundown, to discourage nighttime visitors such as deer, raccoons, and bears. Over time, you will be able to get a feel for what proportions are right for each day. Store your feed in a cool, dry place. Keep it properly sealed to protect it from bugs and rodents. A plastic storage bin is a great choice. One that can be easily opened while wearing gloves is even better! If your feeding station is over a deck or patio, consider our Birder’s Secret® Neat Feast® Wild Bird Mix, which is shell free and is ideal for areas where clean-up is an issue. 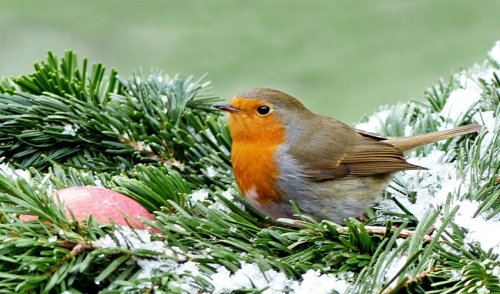 Feeding wild birds in the winter is a great way to give something back to the creatures that you’ve enjoyed all year long. There are few things more satisfying on a winter’s morning than looking out of your window and seeing them enjoying their meal.